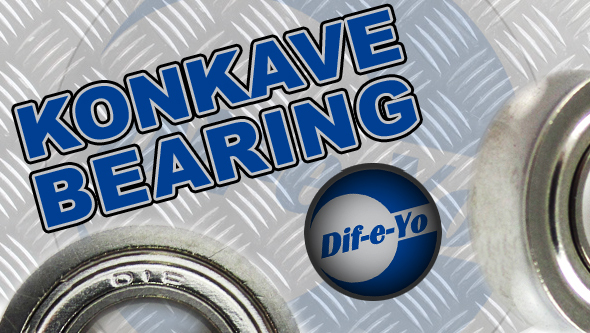 Genuine Dif-e-Yo KonKave Yo-Yo bearings are designed by Dif-e-Yo. These are not off the shelf Generic bearings with a shape machined into the outer race afterwards. They are Manufactured from scratch to Custom Tolerances with specific Higher Quality Parts and Stainless Steel Materials specified by Dif-e-Yo for Dif-e-Yo. These Specifications are the result of trial and error with one purpose in mind. Create a bearing offering maximum performance Solely for use in a free spinning Yo-Yo. The specific Dimensions and Shape of the Patented KonKave bearing is also the final results after trial and error of different shapes in order to achieve consistent string reaction. The Specific depth and uninterrupted Radius centers the string but at the same time allows string movement when needed for response and string layering. The Dif-e-Yo KonKave outer race surface is Precision ground and then Polished to a Mirror Finish for Smooth string movement across the surface.